Graham’s margin of safety is the difference between a stock’s price and its intrinsic value. In theory, the further a stock’s price is below its intrinsic value, the greater the margin of safety against future uncertainty and the greater the stock’s resiliency to market downturns. You also have to have the knowledge to enable you to make a very general estimate about the value of the underlying businesses. But you do not cut it close. That is what Ben Graham meant by having a margin of safety.You don’t try and buy businesses worth $83 million for $80 million. You leave yourself an enormous margin. When you make an investment the laws of probability apply since the decisions involves risk, uncertainty and ignorance. Many people make the mistake of assuming that buying a quality business ensures safety. …most investors think quality, as opposed to price, is the determinant of whether something’s risky. But high quality assets can be risky, and low quality assets can be safe. It’s just a matter of the price paid for them….Elevated popular opinion, then, isn’t just the source of low return potential, but also of high risk. Similarly, just because the price of share of stock in a company is beaten down from formerly high levels does not make it “safe” to buy. The margin of safety concept is about making it likely that you have the odds significantly in your favour by trying to find a substantial cushion in terms of the odds. Because investing is as much an art as a science, investors need a margin of safety. A margin of safety is achieved when securities are purchased at prices sufficiently below underlying value to allow for human error, bad luck, or extreme volatility in a complex, unpredictable, and rapidly changing world. If you think you cannot afford to lose much from your stocks, it always pays to have a good margin of safety, say around 30-40%. This means that you must buy Rs 100 stock for not more than Rs 60-70. What you are trying to do when making an investment is to find a mispriced bet. What margin of safety is all about is finding a “significantly” mispriced bet. The bad news for some people in all of this is that investing is hard. But the good news is also that investing is hard and if you have the right temperament and are willing to do the necessary work the process can be fun. To better deal with inevitable mistakes we all make as human beings, you should have built into the process a “margin” of sufficient size which ensures that even if mistakes happen the outcome will be “adequate”, as Ben Graham describes. In engineering, people have a big margin of safety. But in the financial world, people don’t give a damn about safety. They let it balloon and balloon and balloon. It’s aided by false accounting. 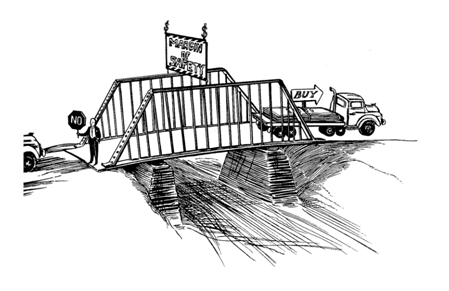 When engineers are building a bridge, they ensure that it is significantly stronger than necessary to deal with the very worst case. The same principle works in investing. So, insist on a margin of error or margin of safety in your purchase price. If you calculate the value of a stock to be only slightly higher than its price, don’t be interested in buying. This margin of safety principle, so strongly emphasized by Ben Graham, is and would always remain the cornerstone of investment success…your investment success.